Any meal in Japan is sure to include some form of chopsticks. Since their invention in ancient China more than 3,000 years ago, chopsticks have been widely used in Asian countries. In Japan, chopsticks are called “hashi” and are used for cooking and eating all kinds of dishes including rice, raw fish, vegetables, noodles, soup and desserts. At some restaurants, you’ll even catch locals using their chopsticks to eat French fries. Being an important dining tool, us Japanese usually learn how to use chopsticks before we start walking. Japanese parents take teaching the skill to their children seriously, as it is considered as one of the most important manners in society. As a child, I remember not being allowed to eat unless I used my chopsticks. If I stuck my chopsticks vertically into rice in a bowl – a big no-no in Japan – my father would scold me severely because that it is a funeral tradition to offer a bowl of rice in this manner to the altar of our departed ancestors. My wife and I also struggled in teaching our daughter how to use chopsticks. At first, she tried to grip it the same way she would hold a spoon, but eventually, with much persistence and patience, she became comfortable enough to pick up food with her chopsticks. Despite chopsticks’ importance to Japanese culture and tradition, there are still some Japanese people that do not know how to use them correctly. According to a survey by the Cabinet Office (2010), only slightly more than half of Japanese over the age of 18 were deemed to be able to hold their chopsticks correctly. In fact, I often observe some young people using their chopsticks incorrectly and awkwardly. In Japan, you’ll have plenty of opportunities to master the technique at restaurants or at the home of Japanese friends. As Japanese food gains popularity globally, having chopsticks skills will come in handy when you enjoy sushi, soba noodles and other Japanese and Asian dishes. Just as chopsticks are a unique, beautiful dining tool, a pair can also be an ideal souvenir for your friends and relatives. Many souvenir stores sell novelty pairs with Japanese animated characters like Hello Kitty or Gundam, but you can also find nicer ones made of lacquered wood or bamboo ranging from 1,000 – 5,000 yen ($8–40). At restaurants and convenience stores, you may encounter disposable chopsticks, called “waribashi.” These are made of wood or bamboo and are attached at the top, requiring them to be split apart before use. As the saying goes, practice makes perfect. Though chopsticks may seem difficult at first, consistently trying to use them will go a long way in ensuring you enjoy authentic Japanese cuisine the authentic Japanese way. Planning a visit to South Korea? You’ll notice the differences of Korean chopsticks both in aesthetic and in use. • Jeotgarak, is the Korean word for chopsticks. • Korean chopsticks are typically made of steel or some other type of metal. This may date back to the Baekje period (circa 18 BC – 660 AD) and used to detect poison in royals’ food. • Because metal is slippery, chopsticks are flat and have rough tips to make picking up food easier. • For table setting, the chopsticks sit vertically and are paired with a metal spoon. • Korean chopsticks are slightly longer than Japanese because of meals are shared and reaching across the table is easier with longer chopsticks. • Chopstick etiquette is something both cultures take very seriously and teach their children early on. • Sticking your chopsticks into a bowl of rice is also a no-no in Korea. Here it is also a funeral rite. 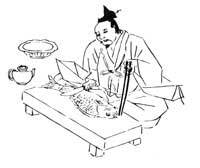 Tatebashi is a ritual where a pair of chopsticks are stuck upright in a bowl of rice and presented as an offering to newly deceased. Doing this at a table is frowned upon for bringing bad luck. 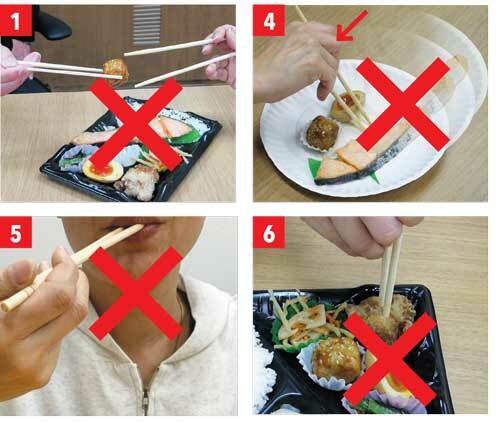 Another blunder to be careful to avoid is passing food directly from one chopstick to another. Much like sticking your chopsticks into a bowl of rice, this also has to do with Japanese funeral rituals. In hashiwatashi, relatives of the deceased use chopsticks to pluck bones from the cremated remains, and then pass the bones from chopstick to chopstick until the remains finally reach the kotsutsubo, or urn. 1. 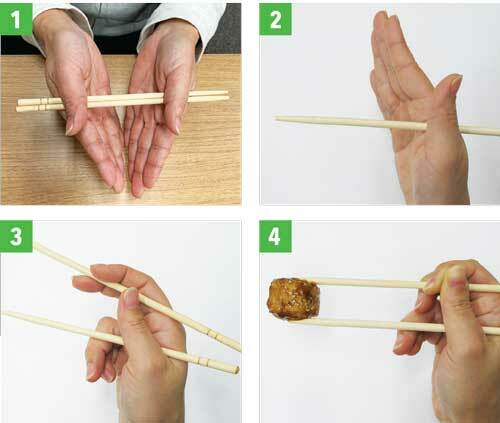 Use both hands when you pick up a set of chopsticks. 2. In the same manner you would hold a pencil, hold the chopsticks about one-third from the top. 3. Then, grip the upper stick with your thumb and index finger, while the lower stick rests on your middle and ring fingers. Practice enables you to grip, divide, pinch and even scoop foods with your chopsticks. To hone your chopsticks skills, try picking up beans, shelled peanuts or rice grains when you’re comfortable with your grip. 1. Don’t pass food from one set of chopsticks to another. 2. Don’t use only one stick to pierce any food. 3. Don’t touch others’ chopsticks with yours. 4. Don’t use your chopsticks to move bowls or plates. 5. Don’t put chopsticks into your mouth. 6. Don’t stick potatoes or other foods with chopsticks. Instead, hold food by pinching up to help lift it or split the potato into small pieces with the chopsticks first.